How would your family benefit from an extra $250, $500 or even $1,000 every month? In this post, I want to share why it’s so important that your family develop a side income and show you how to make it happen – complete with real-life examples of the many ways we’ve added to the bottom line in the Riechmann household. BONUS: Be sure to click here to grab our FREE guide "How to Find a Profitable Side Income Idea in 15 Minutes"
Let’s start by outlining a few of the many benefits of developing a “side hustle” and bringing in an income outside of your 9-to-5 paycheck. Duh, right? Let’s start with the obvious – just like a big raise at work, side income increases your bottom line. If you’re doing the right thing and budgeting every dollar of your income, you probably know exactly where you’d plug in some extra cash. Even if you’re not that organized, I bet you could find some awesome things to do with 500 bucks. You could pay off debt, give more to charity, save for emergencies, go on nice vacations…all the wonderful things that more income allows your family to enjoy. Good stuff for sure, but this is just the start! If you put it in the right context, more money is ultimately about enjoying more freedom. When you’re not stuck living paycheck-to-paycheck but instead start building more margin in your budget, it gives you options to do more of things you want to do as a family. In practical terms, killing off debt payments and boosting your income to reclaim your monthly cash flow gives you the freedom to make choices about how to spend your money and your time. It could also represent the opportunity to leave a job you don’t enjoy to do something you love. This is where a side income really starts to separate itself from a regular paycheck. The raw truth is that dependence on a single income source is really dangerous – you’re only an economic downturn or angry boss away from losing it all. When you develop alternative forms of income, you can not only build a bigger emergency fund and nest egg, but you can enjoy the security of knowing that one change won’t wipe out your inflow of cash. And as your side pursuits mature, you’ll likely find that you can automate (or hire out) much of the work and create passive income that supports you without direct investments of time – that’s true financial freedom! What starts off as a modest attempt to make an extra $200 could grow into something much, much larger. Many of the world’s most successful companies started off as side ventures or small solo pursuits…have you ever watched Shark Tank? The fact is that you never know where the market may take you – a simple idea can strike it big and grow into a massive success. That’s exciting! One of the awesome benefits of doing good work is that you get to help others in the process. The best way to make money is to provide genuine value by helping people. While you may feel this in your day job, there’s a good chance that your side hustle will connect you more closely with the value cycle and let you experience the real joy of helping others. One of the surprising benefits I’ve found in developing side businesses is that it’s incredibly intellectually stimulating. It’s much too easy to get bogged down in the day-to-day demands of a regular job and never stretch your thinking. When you do work on the side, you’ll gain entirely new skills, feel excited to learn something new, and then get to implement it right away to grow your income. When you think about your dream marriage, there’s a good chance that money will play a role in the lifestyle you desire. I’m not necessarily talking about sipping drinks by the beach, but enjoying the freedom to live life on your terms. In our case, it was our side income that was instrumental in allowing Bethany to stay home with our kids several years ago. Only through side gigs were we able to pay off $54,500 in debt and position our family for the future we desired. Are you thinking that developing a side income is going to steal too much quality time away from your family? I totally get that, and it’s a legitimate concern. It’s all about how you set your business up both in terms of how many hours it requires of you and how much of that time is solo. When you see the list of former and current businesses we’ve done below – you’re going to think I’m insane and that I must have an extra 8 hours in the day…but the reality is that each side gig is set up strategically to minimize the time required (and we’ve dropped most dollars-for-hours tasks over the years). One surprising benefit that we’ve found with our side pursuits is that we can actually enjoy some very high-quality time together. As I note below, my son is my “partner” on one business, and Bethany is absolutely involved in Engaged Marriage. You should view your side business as a real opportunity to connect around an interesting project that benefits the whole family! 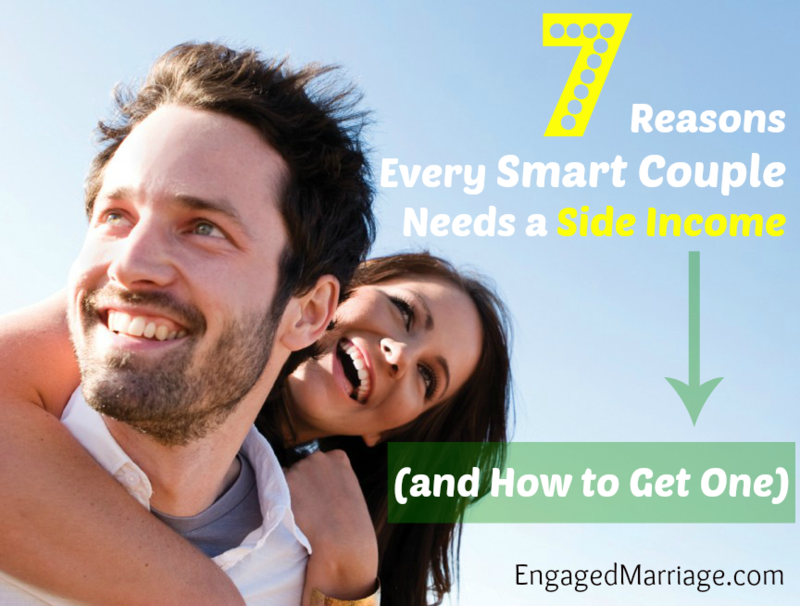 If generating a side income was easy, you’d already be doing it, right? Maybe. We’ve built different streams of side income throughout our 17 years of marriage. When we started out, we traded more time directly for dollars, but we’ve learned along the way and also taken advantage of the power of the Internet. Here are several examples of side income streams that we’ve enjoyed in our household along with a short description of each. This was one of the first side businesses I did, and it was quite profitable with more than $1,000 a month in income. The model works for lots of different items, but I got into golf clubs when I was trying to find the right set for myself (this is often how I find business opportunities). In a nutshell, I bought clubs locally (through Craigslist mostly), cleaned them up, and sold them nationally through Ebay. It’s a classic case of buying low in a local market and selling higher to a broader audience who will pay true market value. I only quit doing this because it was too time consuming for me to travel around the region buying the clubs, and we discovered more passive income streams. Both Bethany and I have tutored kids in various subjects, and it’s a nice way to make extra money. I still tutor a neighborhood high school student in math occasionally as a favor – I enjoy it and we use the money to pay our kids for household chores. There are SO many opportunities to teach what you know to others. One the best ways to do this is to create a simple course on a platform like Udemy where you can reach the world. You can create the course once and sell it many, many times. I have one course on Udemy currently. I’ve also taught engineering courses at a local University, which I found quite fulfilling. This is more dollars-for-hours in scale, but you may find it’s a great fit for you to teach locally or for a college online. If you enjoy writing, there are pretty much limitless opportunities to get paid to write. One of the best places to find work is through blogs you enjoy – we employ four awesome writers here at Engaged Marriage. I’ve written for other blogs for pay in the past, and I’ve also written articles for magazines. They pay better, but of course this requires more work and specialized skills. If you want to take it to another level and develop more passive income, you can absolutely self-publish a book! The Kindle platform in particular makes it easy, and you can also have Amazon convert your ebook to paperback. I’ve written three books personally, and they all generate a nice passive income through Amazon (and other platforms). This very site is a robust business with income from books, workshops, advertisements, affiliate relationships and coaching. It is FAR from passive with nearly 400 posts written mostly by me and a continuous effort is required, but it’s a true labor of love getting to help others live a married life they love. You can get paid really well for sharing your expertise and guidance with others. I don’t even advertise these services, but I’m able to generate a very nice side income through coaching and consulting. You can coach/consult on just about any topic that you have specialized knowledge in. In my case, I help married couples achieve their dream marriage through strategic planning (set big goals and follow a step-by-step plan to achieve them), and I consult with folks on getting control of their schedule and being more productive. I also do consulting to help others get started or ramp up their online businesses. It’s so fun to apply what I’ve learned in six years of online business to help others generate real income to help their families. This is my latest venture, and I love it because it’s really specific, pretty passive and I get to teach my 10-year-old son about business. When I got into running about 18 months ago, I suffered BAD from shin splints. Long story short, I found a quick treatment regime that really helped me and some of my friends (I actually just ran my first marathon two weeks ago). In the process, I found an opportunity (you develop this mindset once you start a side business) – all the materials I needed to do the treatments were only available from random sources and at pretty high prices. I simply created a short guide on how to do the treatments, then found wholesale sources for the materials needed (foam roller, ice packs, resistance band). I shot a 5-minute shin splints instructional video to put on YouTube and put the Shin Splints Treatment Kit up on Amazon. With NO marketing, we make several sales every week with profits per kit of $15-$22 depending on shipping costs. My son Braden packs the boxes for me and helps me with shipping. I pay him $1 from every sale, and he loves it. This is an awesome way to teach about the entrepreneurship and have fun together while helping others!! OK that’s quite a list – so we clearly LOVE side businesses! Keep in mind that we’ve had small children in our home that last 12 years, and I still work a demanding full-time engineering job (that I love). You can totally do this. You’ll notice that a lot of our endeavors have been centered online, which we love for the flexibility it provides, but I know many other couples who thrive with “real world” businesses helping those in their community. It all starts with one simple idea and a smart action plan…and I know just the guy to lead you on that front! 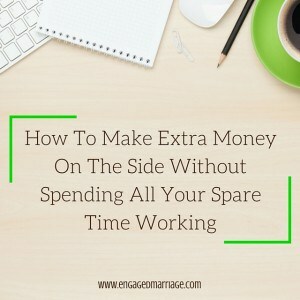 Want The Exact Steps We Use to Make Extra Money On the Side? 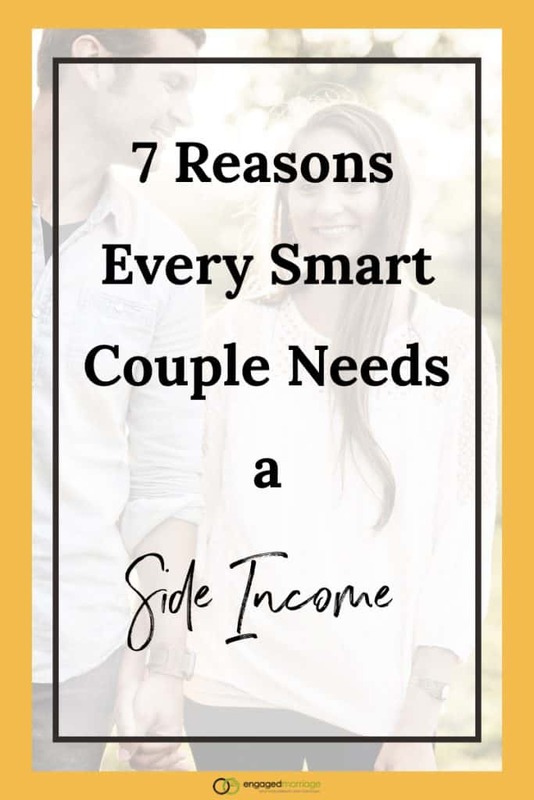 I can only share so much in a blog post before it becomes ridiculously long, but if you’re interested in learning more about creating a side income for your own family – we’ve got you covered. We created an amazing program with my friend and New York Times best-selling author Dan Miller called “How to Make an Extra $500 per Month on the Side to Bless Your Family” and you can get instant access to it right now. How to get started earning a side income this week… there’s no reason to wait! Even if you have no business experience at all. Click here to get instant access to the side income workshop at amazing value! Download this free guide to find your first idea in only 15 minutes! I love the DS or MLM models – they are great for us stay-at-home moms. I am currently doing Lilla Rose, Origami Owl, Plexus, and Young Living. They all offer something different and allow me to earn some money while I stay home with my kids. Thanks for sharing, Heather! It sounds like you’re doing well and staying involved with several opportunities. We also have friends who have side businesses with both Origami Owl and Plexus. Side income is something I seriously want to get started. I have done freelance writing before like you mention but never seem to find an opportunity that I enjoy writing about. I do have my own site which I could try to monetize but I don’t know if I or my content is ready for that. Question: Is Engaged Marriage looking for any new contributors? My perspective would be from young marriage (less than 2 years) and even younger parents (6 months). Thanks Trevor! We are not currently looking for new contributors, but I definitely appreciate your interest and stay tuned since that could change in the future. I I am so looking for something to do. I am married and have a seven year old son. Will be going through your free guide now. Dustin, of a truth you write classical posts that will stand the test of time. You really poured your heart on the above post and I don’t think there is any family that will say they don’t need extra income. The problem is having the heart and discipline to implement the above ideas or guide. Moreover, before any family will genuinely implement the above ideas as to reap the benefits, they must be committed to each other and their marriage. The real problem with some couples is that they are not committed to their marriage genuinely. To reap maximally from “how to make it happen” or rather guide as Dustin gave above, couples must be disciplined and committed to their marriage and to each other. I am having great success(for once) with this site: http://www.Instant10Now.com Check it out…You get paid instantly too! People are making over $1000 a day! There are so many ways people can turn skills into side income it is truly amazing. I had side businesses ever since I can remember. In high school I taught swim lessons and guitar lessons. In college I started a small house cleaning business with me and some of my friends. Then I launched a lawn business on the side. Then I began writing for side income. There are so many things people could do. You are just scratching the surface on side income ideas, but it would take hours to compile a massive list. This is helpful and exciting. I’ve been trying to think of something i can do on the side while being a stay-at-home mom to two little ones. I’m glad you enjoyed it Meredith! Thank you, Dustin. I love reading some of your articles. Great post. It is really an advantage that couples have another income to be able to save more for the future. In the future, they can not work as hard as they can just like now but they can already afford what they want if they can set aside money from the side income that they have.